Our reader Tobias Giesen posted the very first short Sigma f/2.8 for m43 lens review (Click here to read it). 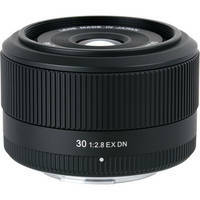 In short, he found the Sigma lens focuses fater than the 20mm f/1.7 lens. And that’s certainly a bit of a surprise. The lens is decently sharp wide open but there is one major issue…CA (Chromatic Aberration). But read his full test and see the many image smaples to get an idea of the image quality. You can (pre-)order the lens at Adorama (Click here), Bhphoto (Click here) and Fotomundus (Click here). Speaking of Sigma, DSLRmagazine (Click here) interviewed Mr Kazuto Yamaki (CEO of Sigma). The interesting bits of info. The 30mm and 19mm lenses are deisnged for their own DP series, NEX system and m43 system (For cost savings reasons). The MTF graph is very good but MR. kazuto said that sadly they cannot rely on the camera software for automatic lens corrections. previous post: New Olympus E-M5 videos and test from dpreview. next post: Panasonic GX1/G3 and old fashion E-P1 and E-10 reviews.